Check out how many calories in Kim's Whole Wheat Banana Nut Bread. Get answers to all your nutrition facts questions at FitClick. Tip: For nutritional information on all the ingredients in Kim's Whole Wheat Banana Nut Bread just click on each ingredient name. Then adjust the serving size for any Kim's Whole Wheat Banana Nut Bread ingredient with the serving size tool in the nutrition facts area to the right to see how you can save calories, carbs and more. Mix ingredients in order of list. Pour into 2 non-greased 12 muffin tins about 1/3 to 1/2 full or 2 loaf pans. Bake for 45 minutes for muffins or 1 hour for loaf, until top is lightly brown and batter is set and pulls from the sides of the pan. Note: 1 Cup of milk with 1 tsp of vinegar or lemon juice mixed before added to ingredients may be substituted for buttermilk. Chopped apples or other fruit work well in this bread. Walnuts may be substituted for pecans or nuts omitted. 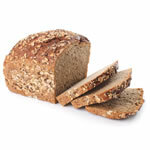 Find more recipes like Kim's Whole Wheat Banana Nut Bread. FitClick has over 60,000 foods and recipes with detailed nutrition information to view.